The Place My last visit to Bacchanalia was about two years back before it was awarded One-Michelin Star, and I had the opportunity to return recently under the helm of their new Head Chef, Luke Armstrong. The restaurant along Hong Kong Street has a revamp as well, with slight changes to its interior and seating configuration at the back of the shophouse space, even though the open kitchen concept at the front still remains. Chef Luke joined Bacchanalia in late 2016 and was previously trained under the likes of Brett Graham of Two-Michelin starred The Ledbury in the UK. The Food I had the Seasonal Inspiration Menu (S$168++), a 4-course dinner affair where Chef uses the freshest seasonal ingredients to create the dishes. Most of the dishes use Australian, French and Japanese ingredients. Alternatively, you can opt for the Carte Blanche (S$145++ for lunch / S$238++ for dinner) where Chef will curate the menu according to the freshest ingredients of the day. I started with the Amuse bouche, the Majestic Oyster Bavarois, prepared with Ireland oyster along with Schrenki caviar. I like the creamy texture of the oyster which is infused with champagne. The first course is the Morel, wild morel mushrooms from Loire Valley, France, cooked in French Wine Vin Jaune. The presentation is simple, where the morel mushrooms are stuffed with veal sweetbread and topped with foam. The whole flavour is very fragrant, and delicious. I can’t have enough of the morel veloute. For the second course, I had the Hand-Dived Scallops. The orange sauce here is amazing, prepared from 6 years aged Permesan and red pepper. The Hokkaido scallops is cooked to the right texture, and there is also king crab salad beneath. Mains is one dish which does not come by everyday due to its limited supply, the Mieral Duck. The French duck is dry aged for 6 weeks, before being slow roasted to a glorious pink hue, then served with Tokyo turnip and bitter chocolate sauce. 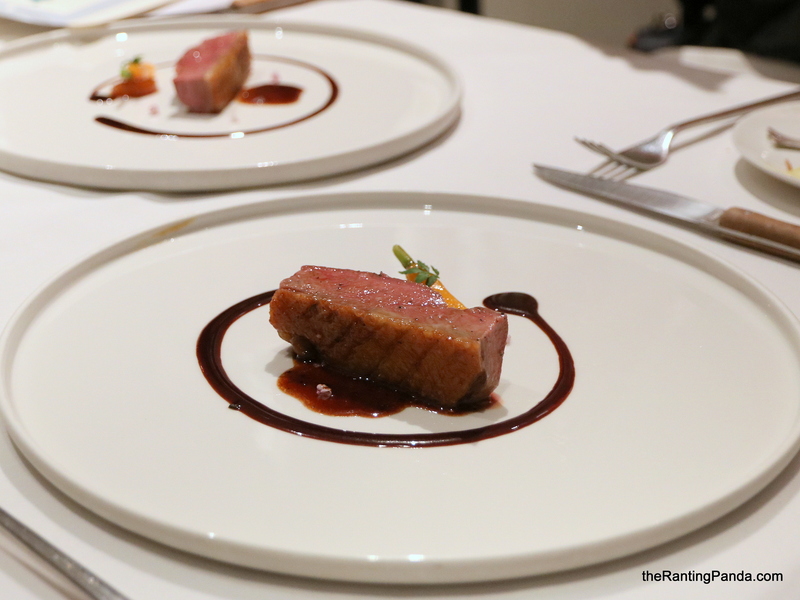 The unique part of the dish is that it also comes with a duck consommé, prepared with a mix of duck stock and duck meats along with Armagnac brandy. I chose to sip the consommé in between bites of the duck meat, which is an interesting combination. Overall, the duck was good, but not wow. For dessert, I was expecting something predictable as it is simply called White Chocolate Tart. It turns out to be more than just a tart. The white chocolate here is being caramelised and topped with Madagascar vanilla from vanilla l beans aged for 4 years. The vanilla flavour is intense with hints of bourbon and goes perfectly with the soft custard tart texture. And that’s not all, as chef pours a white cream infused with champagne over the tart to elevate the flavours further. Rants The portions of the dishes are not huge, and I feel that the dining experience can be further enhanced with snacks in between the courses. Will I Return Again? The dishes at Bacchanalia are above average, though the hefty price tag have raise the expectations much, and we are not sure if we would return. Make your reservation instantly at Bacchanalia here.